Chameleon? Schenker offers an inexpensive and very freely configurable business notebook based on the Clevo W551EU Barebone. Does the endless competition leave room for such an alternative? 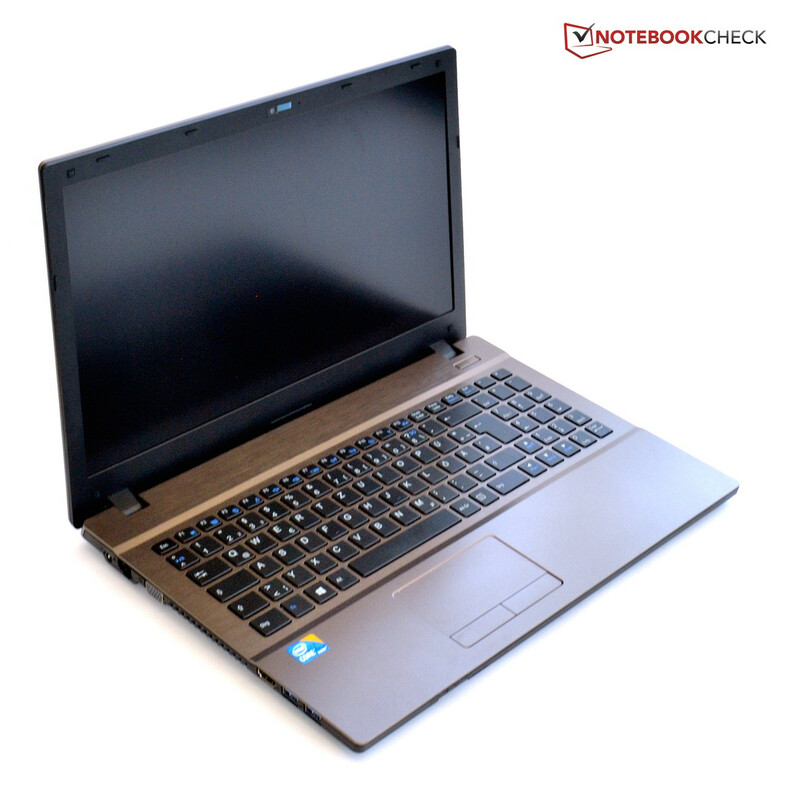 When you think of business notebooks, you generally think of Thinkpads, HP or Dell notebooks. With their XMG series, Schenker is more of a name known among gamers. Schenker wants to try out their success with very freely scalable systems in the business arena and is currently offering five different series to fit the bill. The only current representative of the Schenker Xirios B(iz) series is the subject of this review, the B502, which builds on the Barebone Clevo W155EU. There are a variety of hardware choices available for installation in this model, including: A UMTS module or an mSATA SSD, a second or third hard drive instead of a DVD burner, and one of six possible processors with the latest Ivy Bridge architecture. The only component that will not find a home in the slender case is a dedicated graphics card, so Schenker employs an Intel HD Graphics 4000 integrated into the processor instead. Schenker advertises the notebook as having a long battery life, non-reflective display -- and especially interesting to us -- good manufacturing. Whether Schenker fulfills these promises and how the notebook does compared to the mainstream competition are questions we will answer in the following review. The case is composed of a modest brown. 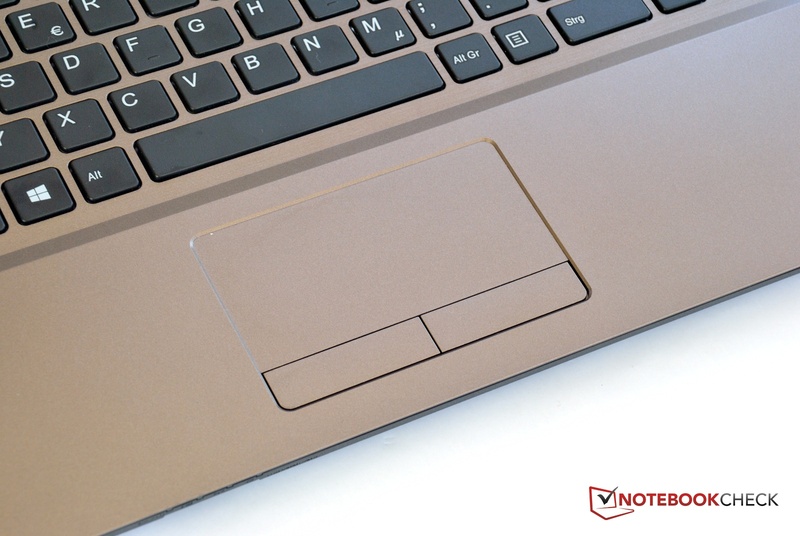 The display lid is made of plastic, but it imitates the surface structure of brushed aluminum; as a result, the notebook looks quite nice at first glance. The matte display is surrounded with a black plastic frame. The display is held in place by two small but relatively strong hinges. Unfortunately, these bounce a little, which is detrimental in environments that are not completely still. The palm rest is made of shiny plastic in the same brown color as the display lid. 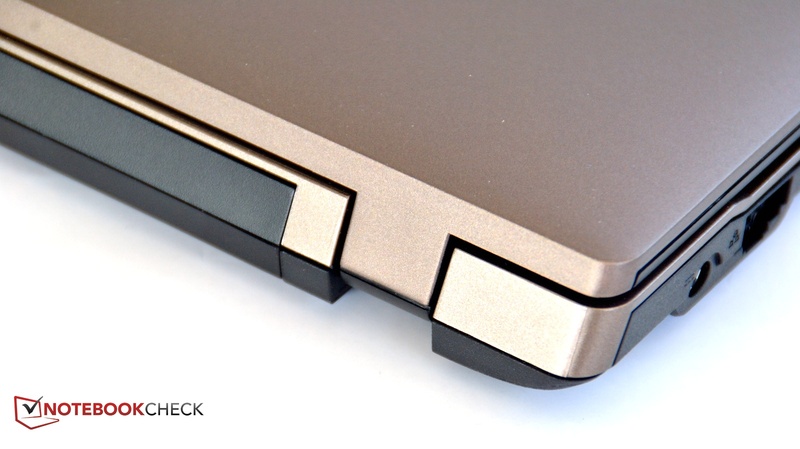 This transitions seamlessly into the keyboard's brushed aluminum look. 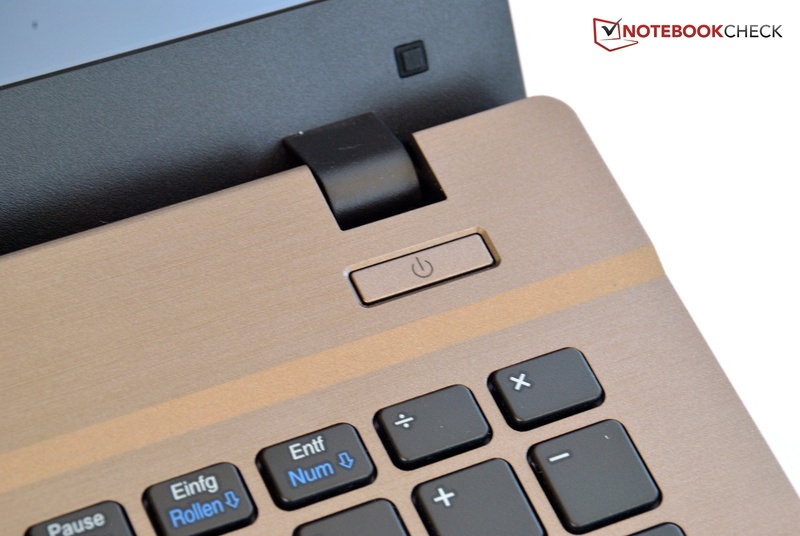 The keyboard is set in the base of the case so that the keys will not collide with the screen when the notebook is closed. The only feature located in the area between the keyboard and the display is the power button to the right. The underside is made of slightly rough black plastic. Neither the Schenker brand name nor the model name/number is anywhere to be found on the notebook. Only the series name Xirios is affixed to the lid of the display. Overall, the notebook has a sophisticated look, even if the materials betray their plastic composition on second glance. We are not convinced of the good manufacturing Schenker advertised. 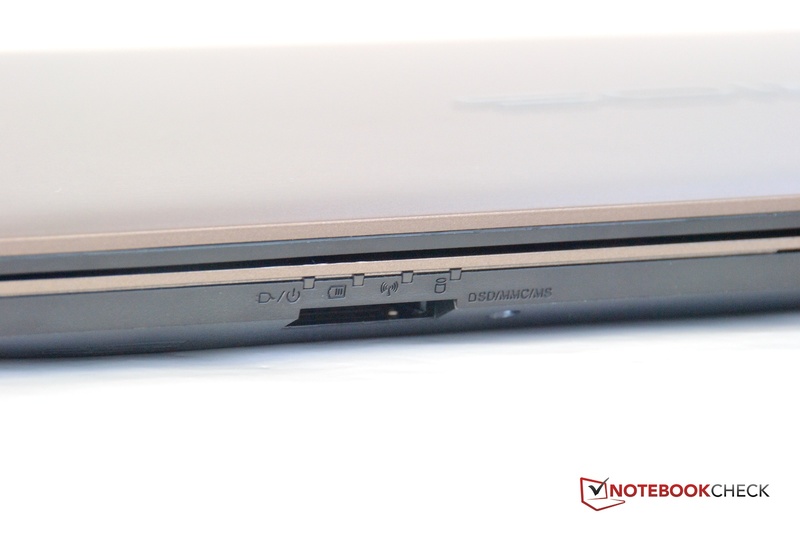 The notebook is very stable and stiff in some areas, but the base unit can be twisted into producing disconcerting cracking sounds without applying much force. 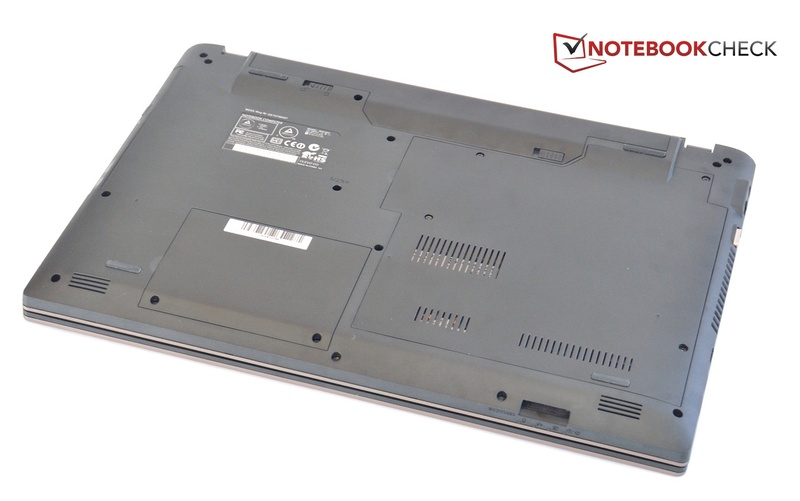 The case yields easily to pressure over the DVD drive and in the area of the keyboard, as well on the underside where the large maintenance hatch is located. In the front portion of the base unit, the corners are uncomfortably sharp and become bothersome if you rest your palms against them. The connections the Xirios offers are the standard fare. To the left we have: The power connection, Ethernet, VGA, and in front of the fan vents HDMI and USB 3.0. For lefties who would like to connect an external monitor via HDMI, the display cable will gobble up space in the front area of a workspace. The analog VGA port produces a good, sharp image at a resolution of 1280x1024 pixels. The connections on the right are just as inconveniently positioned. 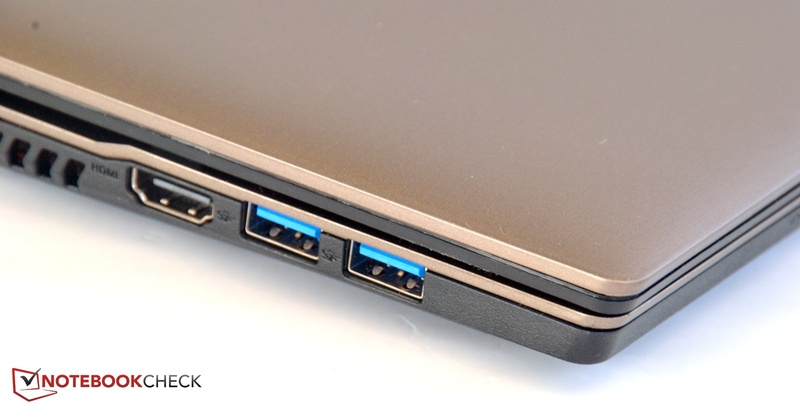 The two USB 2.0 ports and the audio jacks are located toward the front of the device. Further back, in the bay for the optical drive, you can choose between a simple DVD burner, a BD combo drive (DVD burner and BluRay reader) for an additional 60 Euros (~$77) or a BD burner (DVD and BluRay burner) for an additional 97 Euros (~$125). 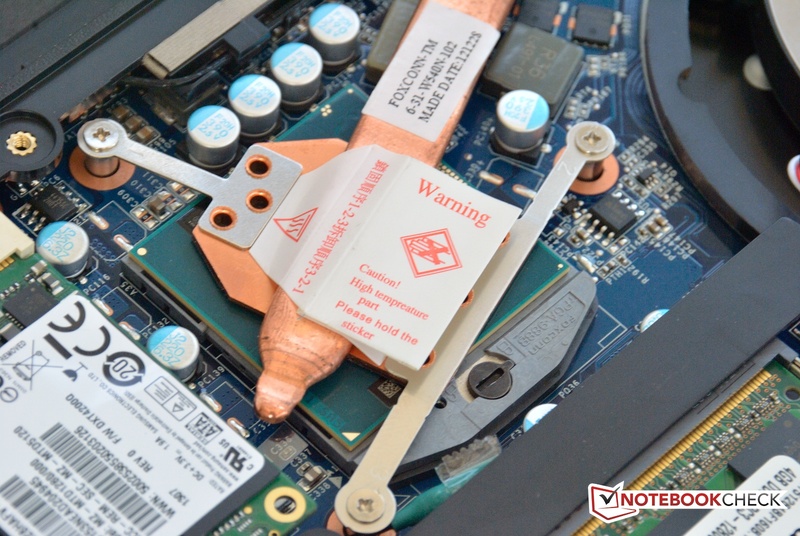 If you would rather make do without an optical drive, you can choose to have a mounting bracket for a second hard drive with SATA II installed free of charge. On the front side, under the status LEDs Schenker installed a card reader (MMC, RSMMC, MS, MS Pro, MS Duo, SD, Mini SD, SDHC, SDXC). The standard WLAN module for the device is the Intel Centrino Wireless-N 2230. This module supports the standards b, g and n in the 2.4 GHz range. For 11 Euros (~$14) more you can get the Intel Centrino Advanced-N 6235, which is installed in our test model. This module supports the standards a, b, g and n in dual-band mode with 2.4 and 5.0 GHz. The reception quality of this module is above average. Bluetooth 4.0 is integrated into both modules. The RTL8168/8111 chip from Realtek is responsible for Gigabit LAN. 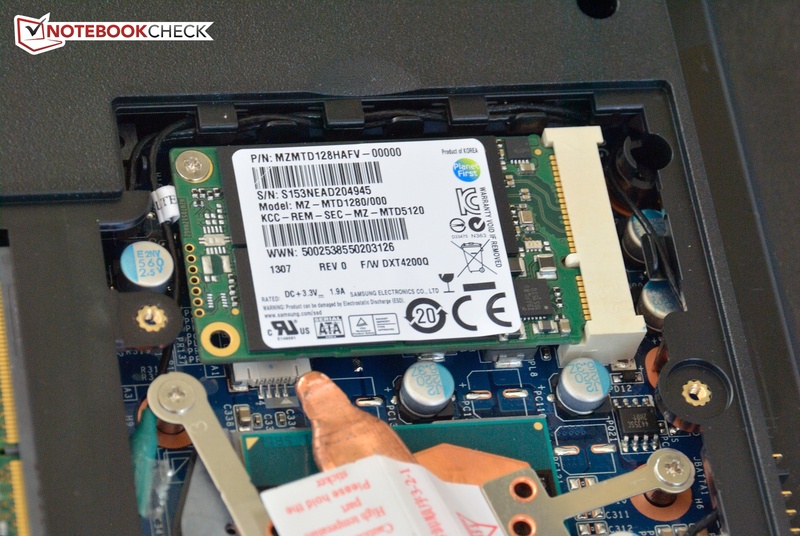 Instead of the mSATA SSD installed in our model you can also select a broadband module. The optional UMTS module costs 99 Euros (~$127), or you can pay 199 Euros (~$256) for the LTE module AirPrime MC7710. Internet surfing goes faster with LTE, given that you have the necessary wireless contract. 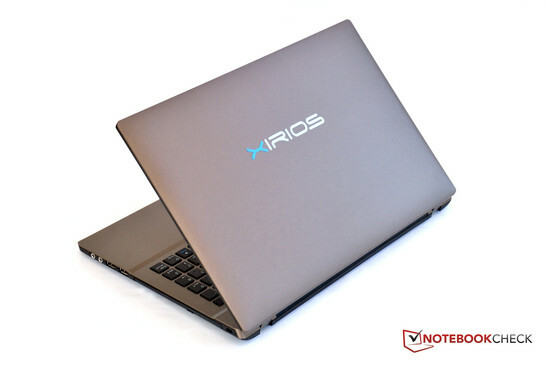 Even though the notebook is intended to be a business class device, besides a Kensington lock the Xirios does not offer any security functions. 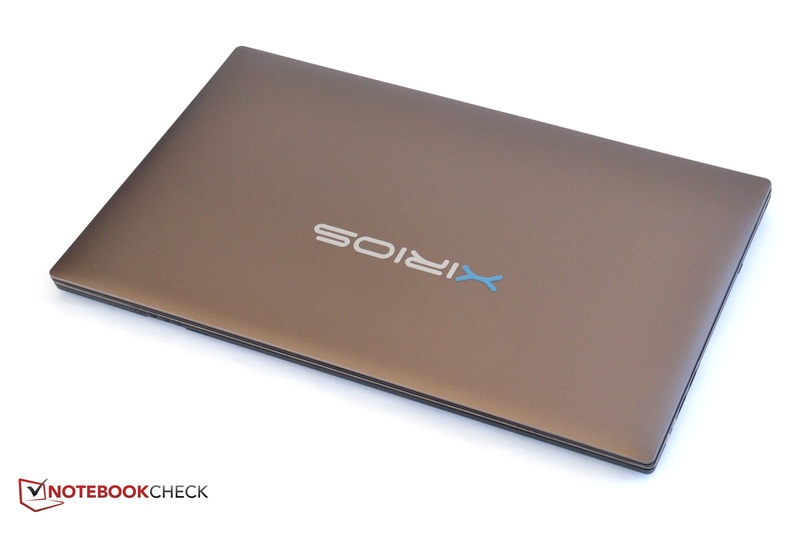 Despite the Xirios B502's very high price of 1,100 Euros (~$1416), the notebook does not come with a single accessory. The only other items in the box are a driver DVD and a quick-start guide. Schenker does not offer any special accessories aside from a replacement battery. An optional docking station would have been nice and would have underlined the business-like character Schenker is striving to cultivate. 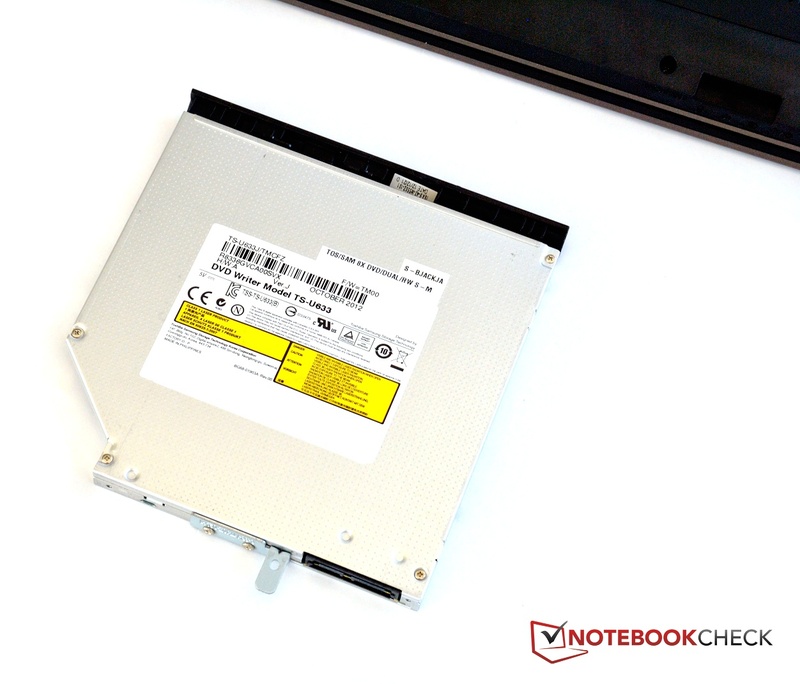 As is standard for Barebones, this notebook is very easy to service. The hard drive is located under a small maintenance hatch. 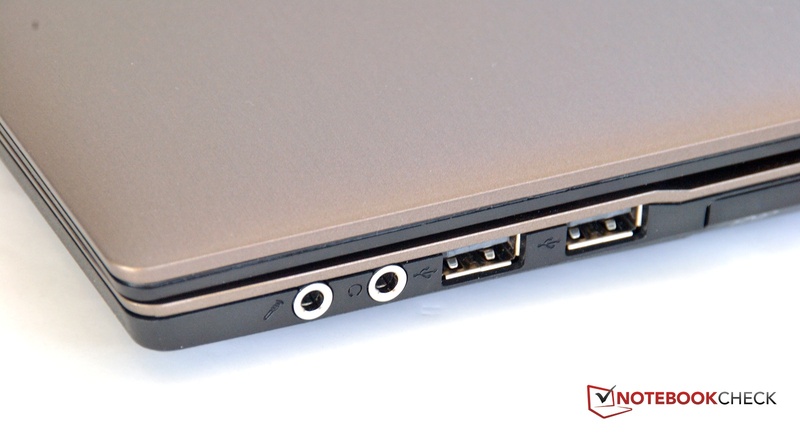 If you open the second and larger panel, you will have access to the two RAM slots, the WLAN card, the mSATA slot and the fan. The manufacturer's warranty is 24 months. For that length of time Schenker will pick up the notebook. For the first 6 months the notebook will be fixed within 48 hours. For an additional 60 Euros (~$77) the warranty can be extended to 36 months, during which the device is fixed within 48 hours for the first 12 months. 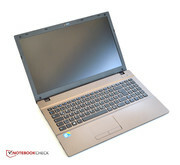 For an additional 120 Euros (~$155) the warranty can be extended to 48 months, during which the notebook is fixed within 48 hours for the first half of the warranty. 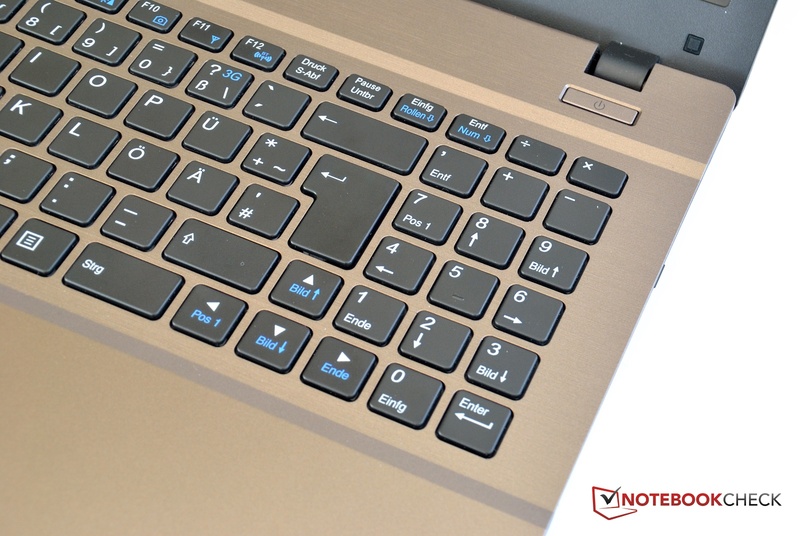 The keyboard is an especially important element of a business notebook, since the user should still be able to type comfortably after several hours of work. 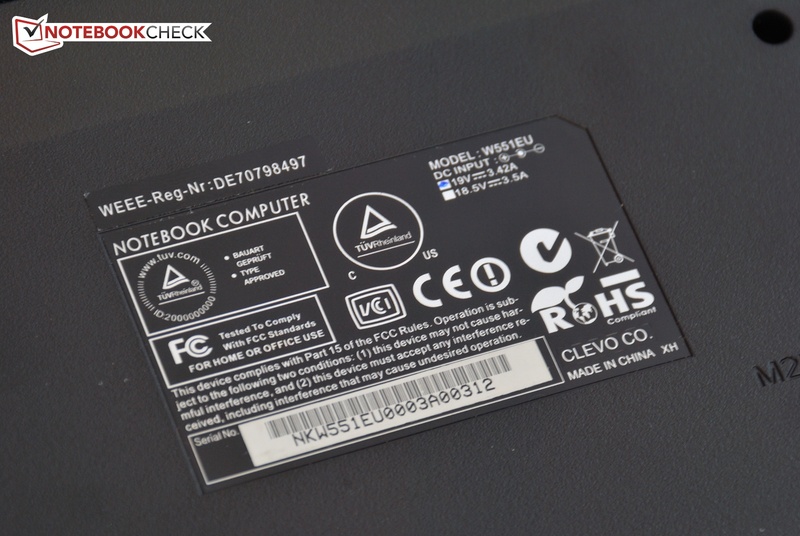 Unfortunately Schenker did not fully consider that and chose to install the Clevo W551EU Barebone, which is a below average keyboard. The chiclet keys are embedded in the base unit. Unfortunately, the flat keys have a very short travel and weak feedback, so it is not clear whether you hit the key or not. The keyboard also rattles on the left in the area around the "D" key and is audibly bothersome. One positive point is the presence of a numeric keypad, though learning to use the layout with the unusually placed arrow keys takes some adjustment. Unfortunately the keyboard is not lit. 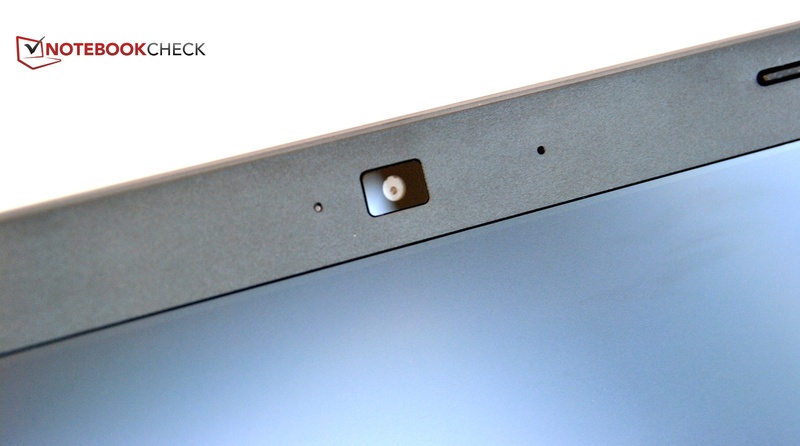 The touchpad is from Synaptics and is slightly recessed in the base unit. That measure ensures that the user feels the perimeter of the pad clearly. It reacts precisely all the way to the edge and the mouse replacement keys are comfortable to use. At 92 mm x 46 mm (3.6 x 1.8 inches) the touchpad is sufficiently large, and with its diverse settings options it can please any user. Schenker, or rather Clevo, offers two possible matte panels as options for the display. 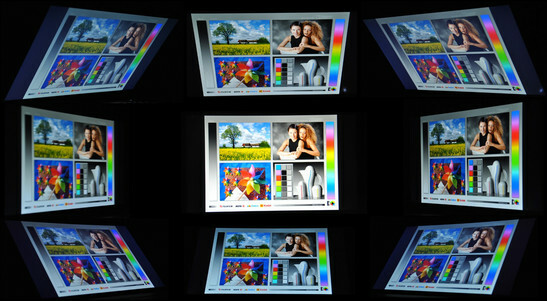 The display with a resolution of 1366x768 pixels is available at no extra charge. For an additional 90 Euros (~$116) you can buy the IPS panel installed in our test device. This panel, produced by LG under the product name LP156WF4-SLB5, has considerably better viewing angle stability and a resolution of 1920x1080 pixels. Due to the high resolution, the letters are already somewhat small when the text size is set to 100%, so the display's default text size setting is 125%. Unfortunately, this means some programs encounter display errors as a result of the text jutting out from the elements. The brightness values are very good. An average of 374 cd/m² is not common. 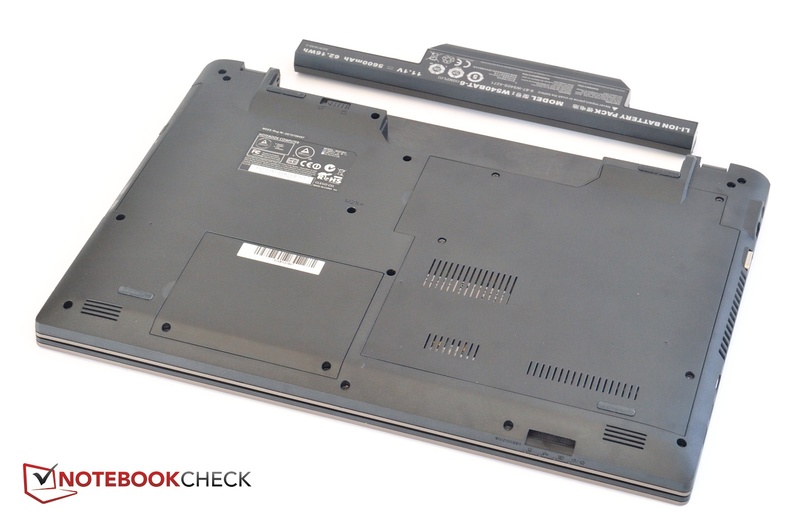 The displays installed in the reliable Thinkpad T530 and W530, for instance, only reach values of 220 cd/m² and 260 cd/m², respectively. However, the Asus N56VB-S4050H's panel is on par with the Schenker display. 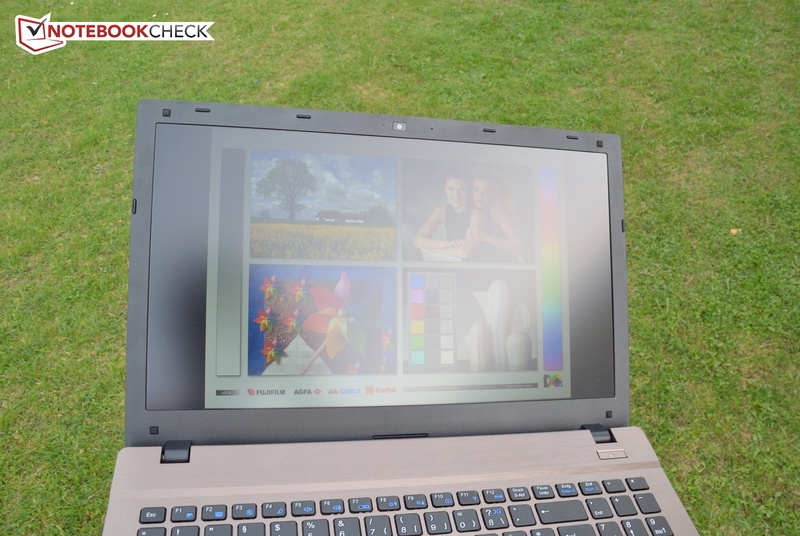 Our test device's illumination level is not quite ideal; the display's light density in the lower range is "only" 336 cd/m², but at 85% that value is still respectable. 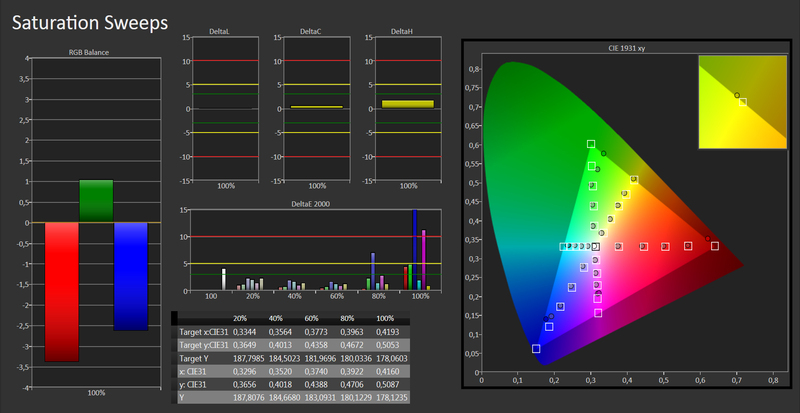 At 0.56 cd/m² the black value is very good. The black value together with the high light density brings the panel to a contrast of 691:1. As a result, images and video appear more brilliant and text is easier to read in bright environments. We used a Colorimeter to measure the display's image reproduction quality both in its factory state and after calibration. In the notebook's factory state the color accuracy, grayscale and color saturation measurements deviated greatly from the ideal values. After calibration, the grayscale was satisfactory, but in blue and magenta especially, the color accuracy and color saturation still deviated markedly from the standard values. 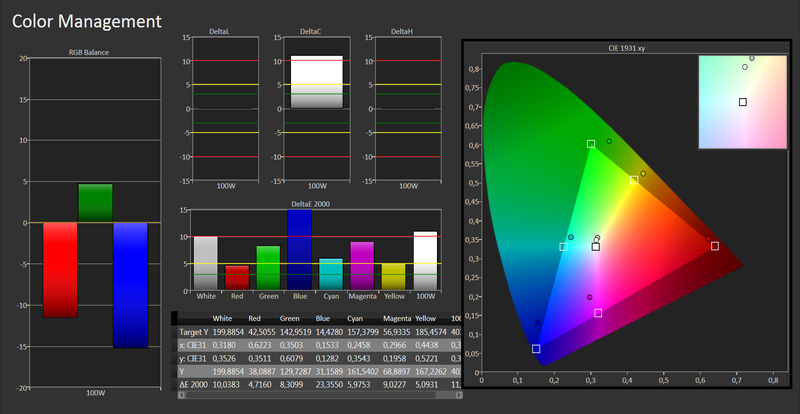 The display does not cover professional color spaces. 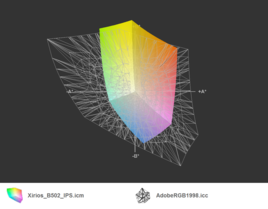 It can reproduce neither the sRGB nor the more demanding AdobeRGB color space, nor does it come close. 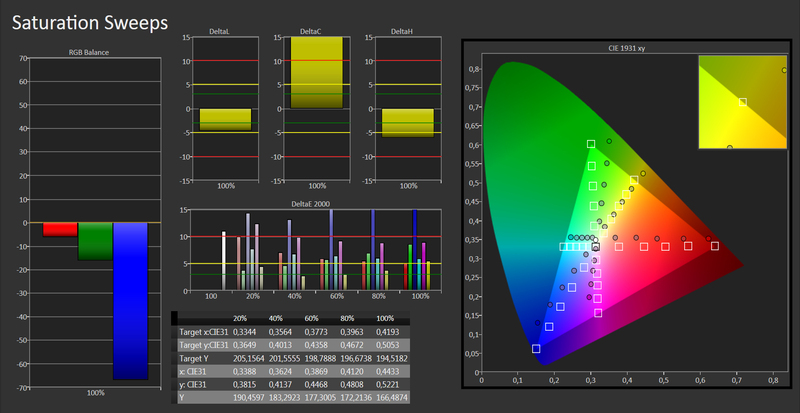 However, this should only be an important criterion for photographers or graphic designers. 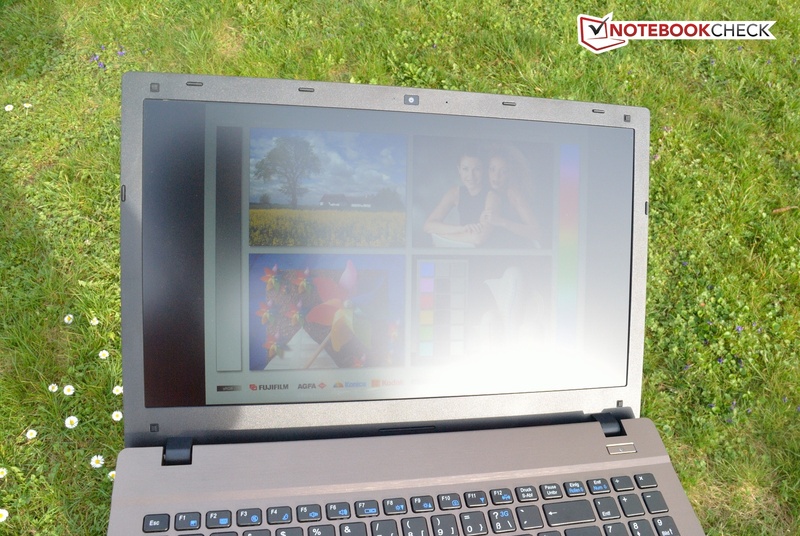 Due to its non-reflective display surface and high brightness, the notebook is practically made for use in bright environments or out in the sunshine. The viewing angle stability is very good; the colors are clearly recognizable from every perspective. The reason for this is the IPS technology used in the panel, which is clearly superior to the TN panels found in less expensive notebooks. Only the brightness diminishes at extreme angles, though that is not a big loss. 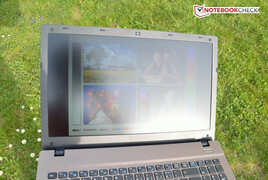 The notebook's performance is very configurable. With six different processors, working memory from 4 to 16 GB and 29 possible mass storage devices to choose from, Schenker leaves no wish unfulfilled. 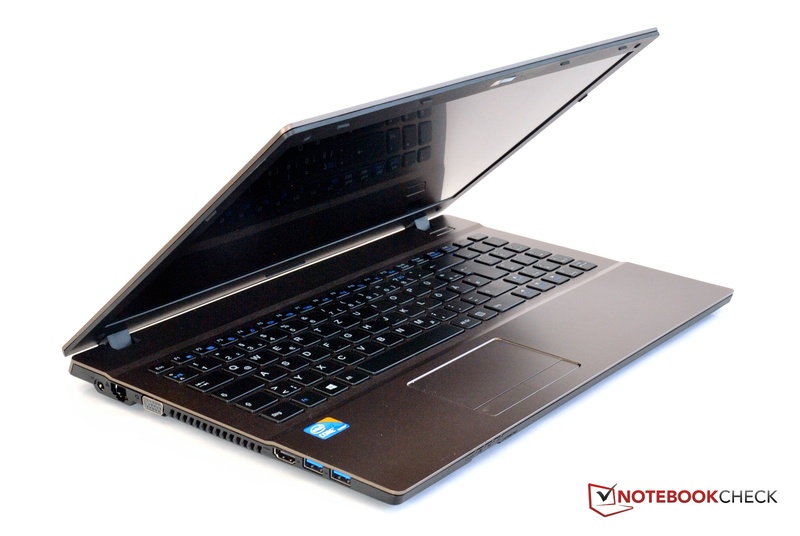 However, there is not any space in the notebook for a graphics solution besides the one integrated into the processor, which limits graphics performance. 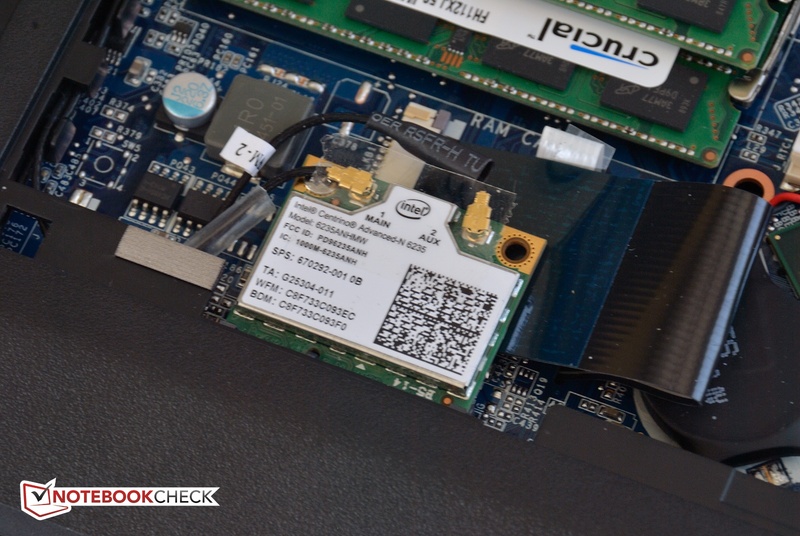 The Intel Core i7-3632QM installed in our test device is currently available for an additional 146 Euros (~$188). The quad-core processor works with four cores that can process eight threads. The standard frequency is 2.2 GHz, though all four cores can overclock up to 2.9 GHz if a higher frequency is necessary to reach the performance demands. The TDP of 35 Watts is low for a quad-core processor; the TDP of the next fastest Intel processor is a whole 45 Watts. 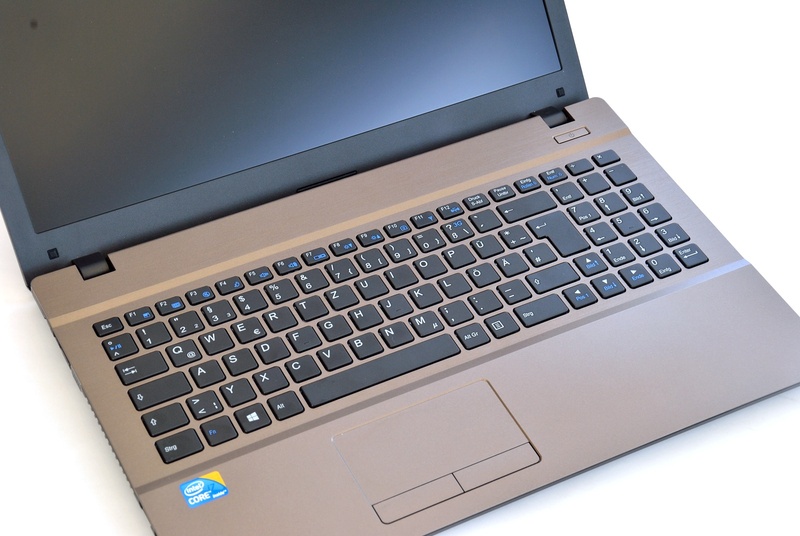 Despite the flat build of the notebook, the processor's performance is good. In Cinebench 11.5 Multi the Intel Core i7-3632QM reached 5.84 points -- a better score than the Lenovo IdeaPad Z500 (5.35 points), even though both notebooks have the same processor. The eight threads that can all run in parallel make it easy for the Core i7 to multitask. As long as an application only demands computing power from the CPU and not the GPU, it should not be a problem for the Xirios B502. That covers most kinds of applications, like the usual office tasks, complex Excel calculations or database programs. In battery mode the processor's performance is considerably limited. With 3.15 points in Cinebench 11.5 Multi, only 54% of the notebook's performance is available in battery mode. 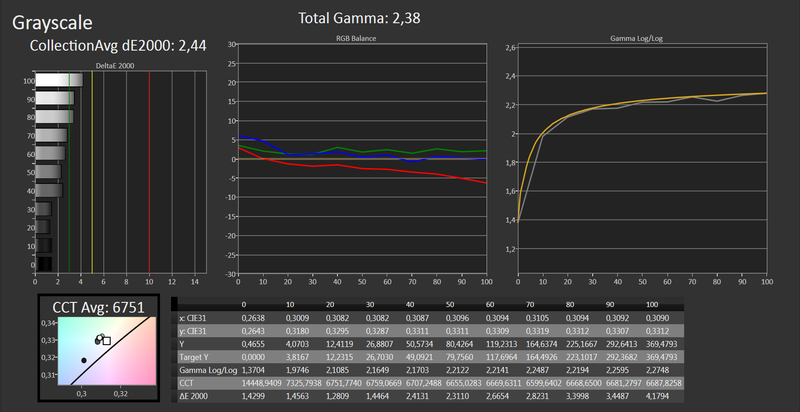 PCMark 7 calculates an overall score based on the system's performance in a variety of scenarios. 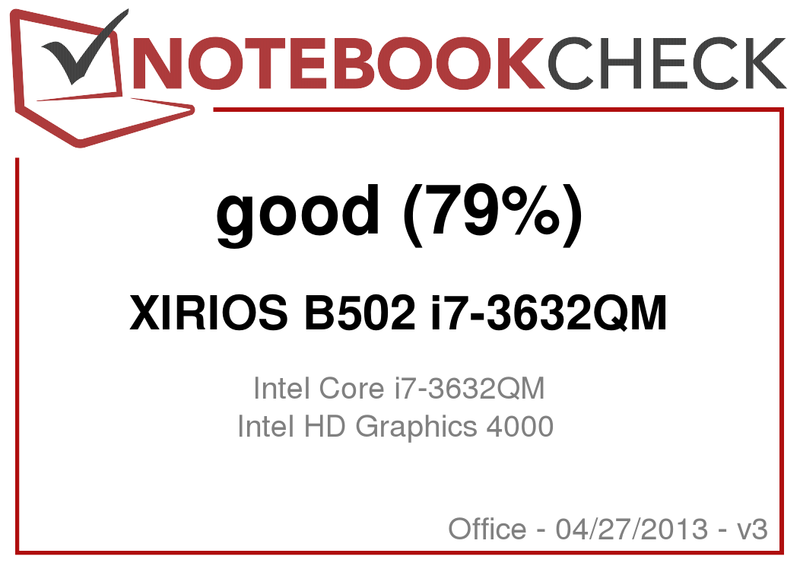 Here the Xirios B502 attained 4682 points -- a very good score, only exceeded by notebooks with better SSDs or dedicated graphics cards. In terms of mass storage devices in the 2.5-inch format, you can choose from a conventional hard drive with anywhere between 320 GB and one TB, or an SSD with a capacity of 60 to 128 GB. Alternatively, you can choose an mSATA SSD with 64 to 512 GB. 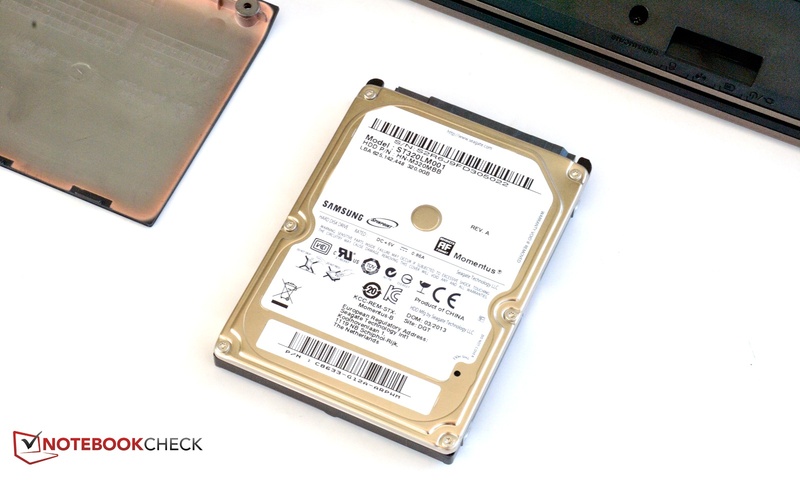 The system partition in our test model is on the Samsung SSD PM841 MZMTD128HAFV, an mSATA-SSD with 128 GB. This enables the computer to reach quicker boot and program load times. Additional files can be saved to the 320 GB Seagate Momentus SpinPoint ST320LM001. The little SSD did well in our sequential reading AS SSD benchmark with a recorded speed of 260 MB/s. But at a sequential write speed of 91 MB/s the drive is almost slow. The drive's speed while copying an ISO file (130 MB/s) was not outstanding either. The bottleneck restricting the read speed is the SATA II interface in the mSATA slot. In the Samsung 730U3E-S04DE the 256 GB PM841 reached a sequential read speed of 516 MB/s. The more spacious PM841 reached a faster write speed as well (248 MB/s). But the notebook's perceived performance while executing office tasks is more dependent on access time. A read access time of 0.12 ms and write access time of 0.075 ms are very good results. The Seagate Momentus SpinPoint ST320LM001 hard drive reached an average data transfer rate of a meager 66 MB/s in the HD Tune benchmark. Its 16.6 ms access time is satisfactory. The combination of two different mass storage devices has a simultaneous advantage and disadvantage: You always have to consider what data to save to which partition. This is especially true because the 128 GB SSD fills up quickly. Moreover, the total available capacity after formatting is only 400 GB, which is not sufficient for saving large quantities of data. But if you need more there are plenty of upgrade options to choose from. 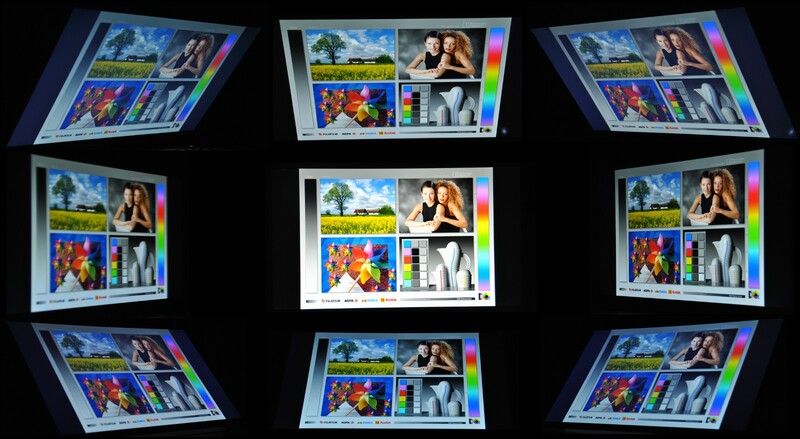 The notebook's graphics solution puts the brakes on system performance. Because no dedicated graphics card can be installed in the device, the Intel HD Graphics 4000 integrated into the processor has to take on the whole task. This graphics card proved to be one of the very top Ivy Bridge models, obtaining 752 points in the 3DMark 11 benchmark. The card has the good processor to thank for its high score. Still, this graphics solution is inferior to mid-class dedicated graphics cards. Nevertheless, the notebook's graphics performance is sufficient for office tasks, playback of HD videos and image editing. Using functions like Intel Quick Sync, the GPU can take over the processor's work during some tasks and thus reduce the CPU load (during video encoding, for example). However, 3D calculations and CAD are only possible to a limited extent with this graphics card. Unlike the processor performance, the graphics performance remains on one level in both battery mode and AC power mode. 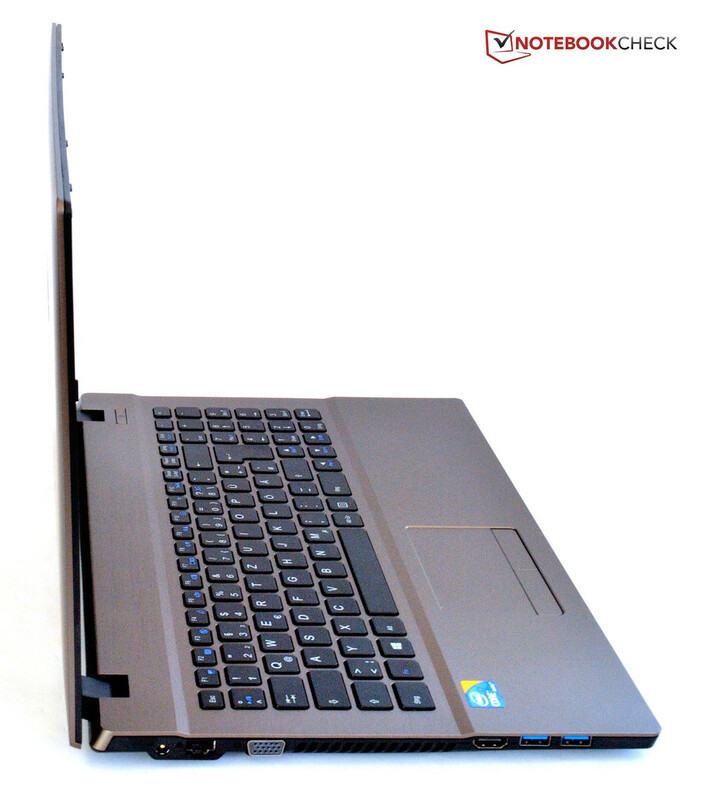 Due to the integrated graphics solution, the notebook is ill suited for playing current computer games. Only FIFA can be played at full resolution and an acceptable quality setting. Hitman: Absolution, on the other hand, is not even playable at minimum settings. 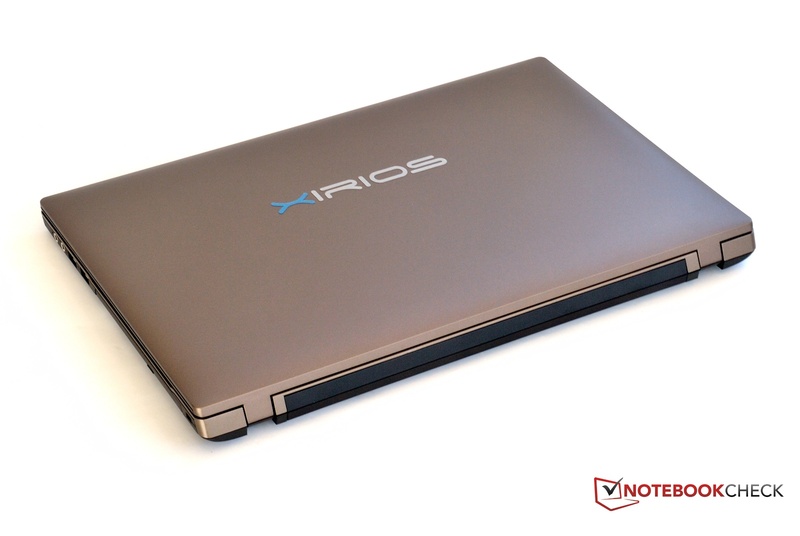 At about 30 dB(A) in idle mode and under low levels of load, the Xirios B502 was barely audible. When accessing the disk drive the computer was somewhat louder (32.5 dB(A)), but still not unpleasantly so. However, when the quad-core processor kicked into gear, the fan had to work hard and did this at a sound pressure level of 40 - 45 dB(A), which over long periods has the potential to be very bothersome. 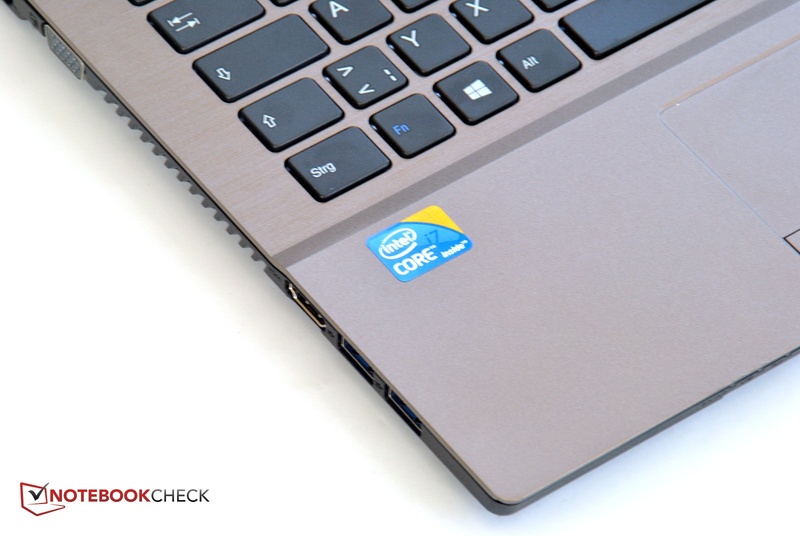 The processor's powerful performance is also evident in the notebook's temperature patterns. 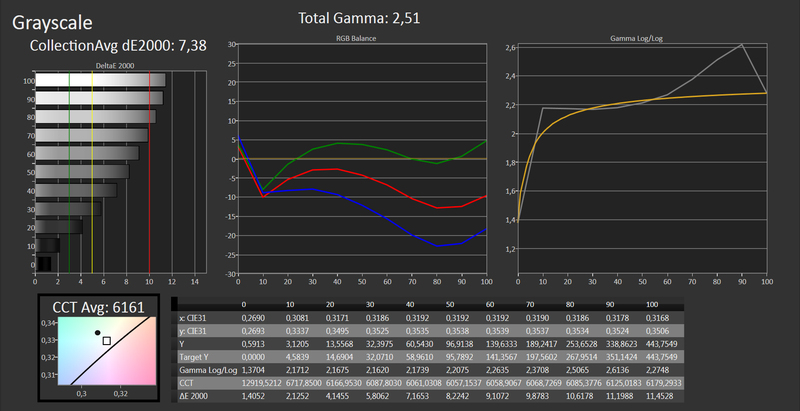 Unlike what we observed in the volume measurements, this evidence is already apparent in idle mode. The front left area of the top side of the notebook warmed to a higher temperature than your hand, and on the bottom side, we measured fan emissions as high as 36 °C (97 °F). That means the computer will stay perpetually warm in your lap even in idle mode. Under load the touchpad and the section of the keyboard over the fan warmed to 39 °C (102 °F) -- an uncomfortably high temperature. On the bottom side, we measured a maximum 41 °C (106 °F). These temperatures are too high for your lap, but should not present a problem if the computer rests on a hard surface. In our stress test, both the processor and the graphics solution labor at their full capacity for over an hour. We use this test to measure cooling, since weak cooling causes a notebook's CPU and GPU performance to drop. Happily, this did not happen with the Xirios B502. The processor worked at a constant frequency of 2.7 GHz and thus remained considerably above its standard clock frequency of 2.2 GHz. The speakers are low quality. They are sufficiently loud and do not distort the sound, but music suffers from a severe loss of detail and bass is non-existent. However, for a small-scale presentation the speakers' performance should be adequate. In idle mode and under low levels of load the notebook was very frugal, consuming only 11 - 18 Watts. 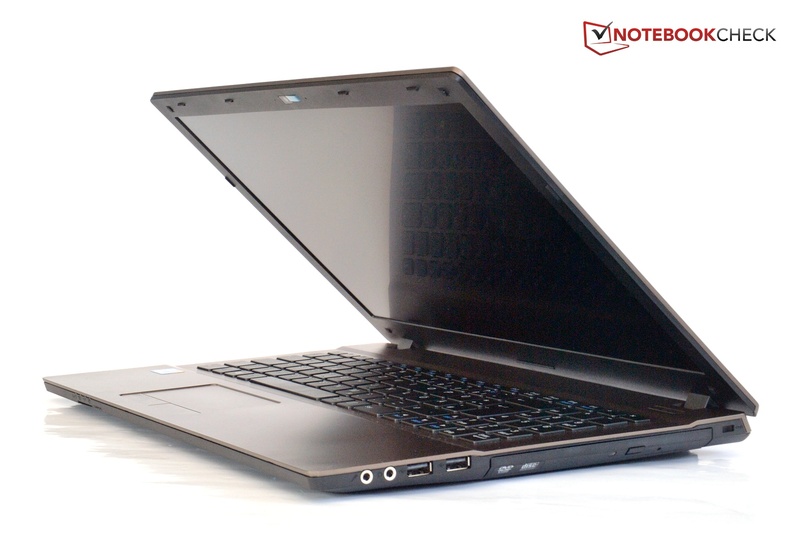 The notebook has the processor in particular to thank for these good values, since the processor lowers its clock frequency with its energy saving function when the performance demands are not too high. The integrated graphics solution is an additional asset here, owing to the fact that it uses less power than a dedicated graphics card. But when the processor was needed the notebook's power consumption shot up to 69.8 Watts, though it then throttled down to 65 Watts. This may have to do with the power supply that unfortunately only provides 65 Watts. 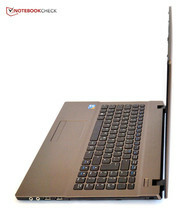 Rather than allowing the notebook to drain extra power from the battery, Schenker decided to cap the notebook's power draw. The Xirios B502 has a battery that is easy to change. 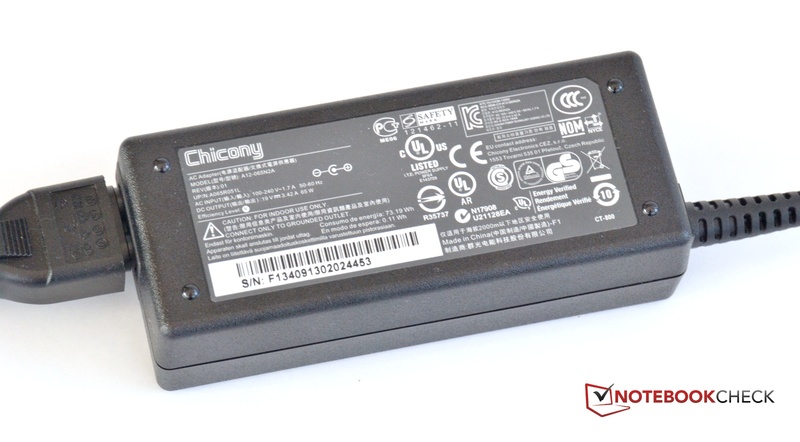 In addition, with 62 Wh the battery's capacity is above average. We measure a battery's longest feasible run time with the Battery Eater Reader's Test, which simulates a user reading a text file. For this test we turn on all energy-saving functions, dim the display to its darkest setting and deactivate all wireless modules. Here the Schenker notebook held out 5 hours and 39 minutes. Much more practical, however, is our WLAN surf test. 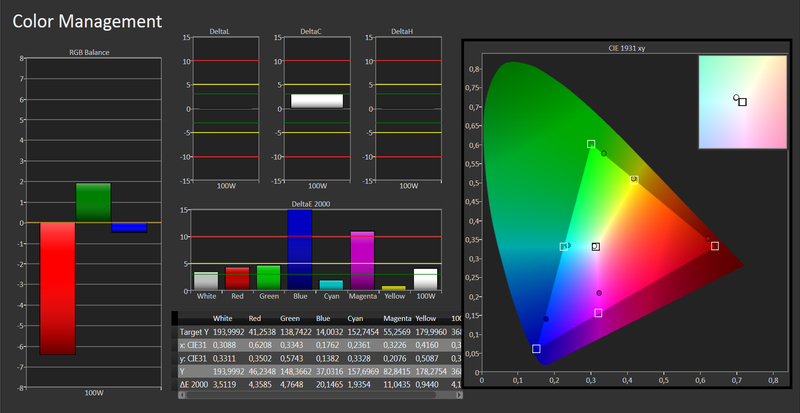 Here we simulate a user surfing the Internet over WLAN with the display brightness set to about 150 cd/m². In this test the Schenker computer ran 3 hours and 21 minutes. For a long train ride that may very well be too short. 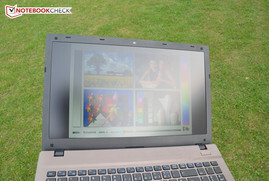 The notebook played a DVD at full display brightness in battery mode for 3 hours and 18 minutes. Very few films last longer than that. We use the Battery Eater Classic test to determine the computer's battery life under load. 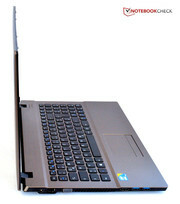 Here the notebook renders a moving 3D scene that demands high performance of both the processor and the graphics card. In this test the battery held out for about 2 hours. The notebook needed about two and a half hours to recharge. Good manufacturing, a keyboard that's comfortable to type on for 4+ hours at a time, a good range of well-positioned connections: All these things distinguish business devices from the mostly more inexpensive options on the market. Yet the Schenker Xirios B502 lacks all those things. But first the strengths of the notebook: The manufacturer chose a very good panel for the display. Its brightness, contrast and viewing angle stability are all worthy of praise. Only the color space is somewhat limited. We can also praise Schenker for the multitude of core components they are offering for the notebook. Here practically every exotic desire can be fulfilled. Only the graphics solution never changes, due to the fact that there is no space in the flat case for a dedicated graphics card. And now we are back to the drawbacks. Because of the integrated graphics solution, the system performance is too low for any work involving high graphics demands. The mainstream competition in the business sector offers not only a plethora of processors, but also at least the option of installing an independent graphics solution. However, for office tasks, relatively undemanding image editing, and high-resolution video playback the performance will suffice. 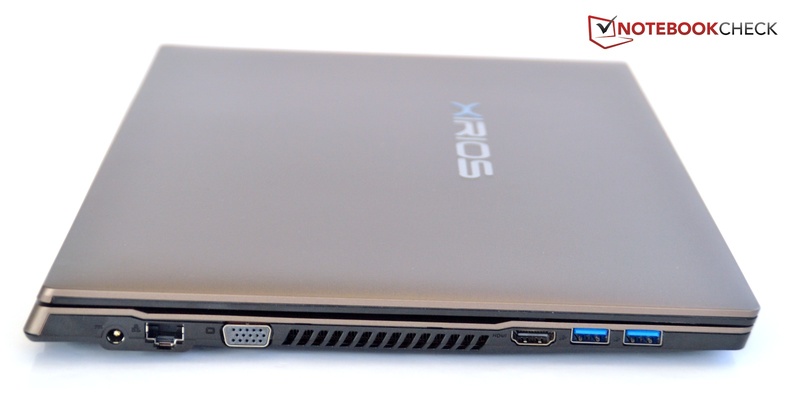 All in all, the Xirios B502 lags considerably behind the competition, like the Lenovo ThinkPad T530, HP ProBook 4540s or Dell Latitude E6530. 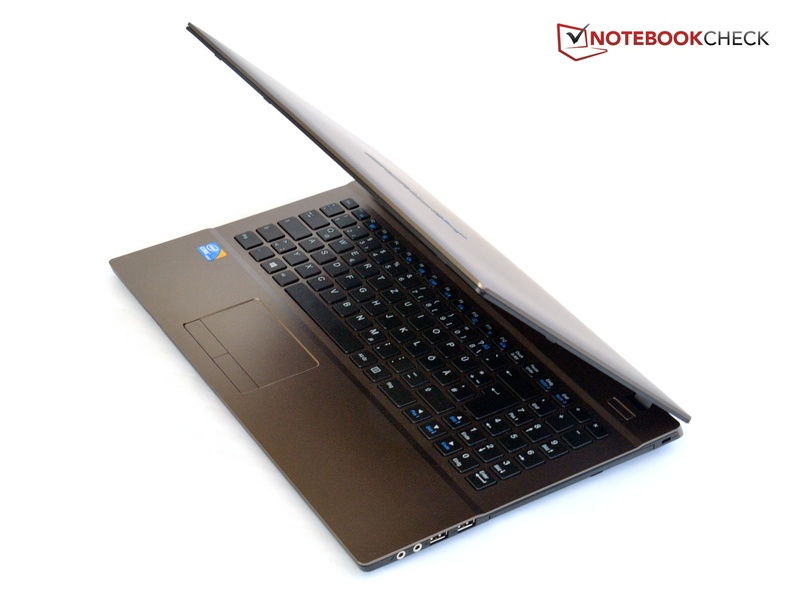 The Asus N56VB-S4050H is also worth mentioning as a consumer notebook that has a much better price-performance ratio. Those who require less of their business notebook and are interested in an unusual configuration may wish to add the Schenker Xirios B502 to their shortlist. ... aims for the business sector. ... is actually just made of plastic. ... though they do bounce a little. ... Intel Core i7 3632QM. The webcam's resolution is 1.3 MP. ... though it could open a little wider. The connections are on both the left and right sides. Here are the two audio jacks. Schenker offers a BD reader and/or burner in place of the DVD drive if desired. ... and the display ports. Hidden in the front is the card reader. ... and the Schenker name is nowhere to be found. ... and has a high capacity of 62 Wh. The notebook is easy to service. Here is the DVD drive. The CPU resides under the cooler. The hard drive is from Seagate and holds 320 GB. The fan can be easily cleaned too. The RAM slots are already full. 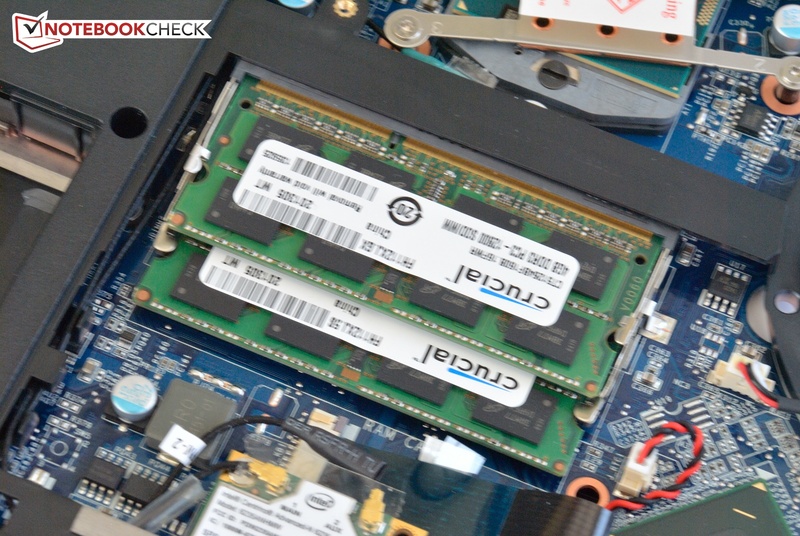 An mSATA SSD is already installed as well. The WLAN card supports a/b/g/n. The power supply delivers about 65 watts. The bright and anti-reflective display. Better manufacturing, and a keyboard good enough for the office. That the power supply Schenker provides is too weak. Schenker should already have enough experience with designing power supplies for their gaming notebooks.